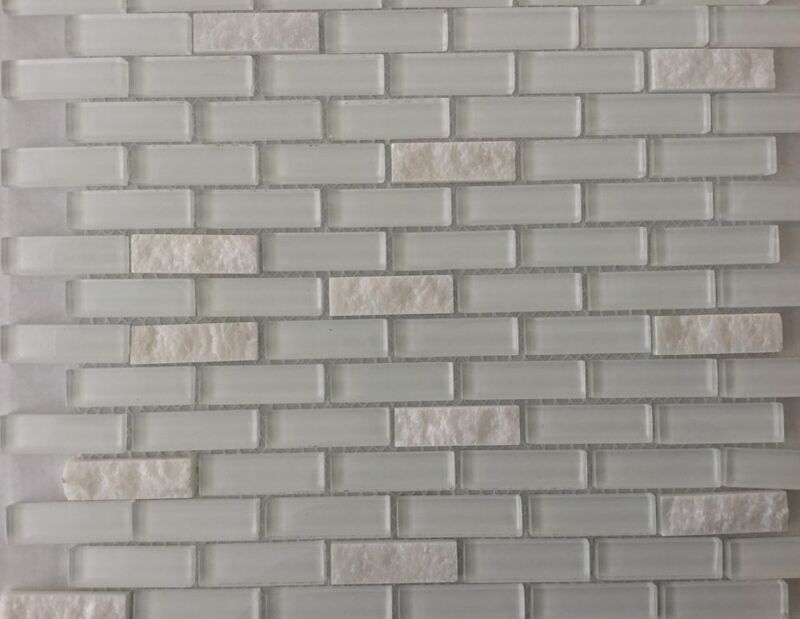 Add a splash of modern styling to your decor with Yukon Ridge Mosaic Tile. A seemingly random blend of white stone and variably finished glass forms this 12 in. x 12 in. mesh-mounted tile, infusing your space with a chic look and a contemporary ambience. The mixed-sheen, mixed-finished tiles will invigorate any residential or commercial setting and are versatile enough to be used outside or on a fireplace surround. They look particularly ravishing as kitchen backsplash or bath wall and also work stunningly as a countertop surface or feature wall. 15 square feet, 15 pieces per case. Case weight is 45 lb. Mixx Marble 12 in. x 12 in. x 9.5 mm Glass Mosaic Tile is a random linear mosaic that creates a sense of depth when installed, and captures and diffuses light. Although not suitable for floor installations, glass tile is impervious to water making it an excellent selection for wet-room wall applications such as shower walls and bathroom backsplashes. This Merola Tile Coppa Amber 12-inch x 12-inch x 4 mm Glass Mosaic Tile features a special fusing process which creates the look of mineral veining in each piece in random patterns with gold and copper striations running through amber and brown. A white thinset and grout is recommended so as not to detract from the rich colors. The thinset will also blend in with the mesh backing making it less noticeable. With the mesh backing, the tile is easily installed in most areas of the home and outdoors to suit your design preferences. Install the Merola Tile Coppa Brown Gold 12-inch x 12-inch x 4 mm Glass Mosaic Tile in your residential space to enjoy a playful, transitional touch. A special fusing process creates gold and copper striations that evoke the appearance of mineral veins and are arrayed in random patterns throughout the contrasting dark brown tile. This mosaic is comprised of durable 1 in. x 1 in. glass pieces and features an impervious water absorption rating. The Merola Tile Riverstone Horizon Red 4-inch x 12-inch x 22 mm Natural Stone Mosaic Tile can help you create a rustic retreat or Zen garden within your home. The Mosaic Tile features smooth stones with natural imperfections for the look of a tumbled-stone river bed. This wall-trim tile is frost resistant. Yukon Ridge 12-inch x 12-inch x 0.24-inch Mesh Mounted Glass/Stone Mosaic Tile (15 sq. ft. / case) Add a splash of modern styling to your decor with Yukon Ridge Mosaic Tile. A seemingly random blend of white stone and variably finished glass forms this 12 in. x 12 in. mesh-mounted tile, infusing your space with a chic look and a contemporary ambience. The mixed-sheen, mixed-finished tiles will invigorate any residential or commercial setting and are versatile enough to be used outside or on a fireplace surround. They look particularly ravishing as kitchen backsplash or bath wall and also work stunningly as a countertop surface or feature wall.